Did you just roll your eyes? 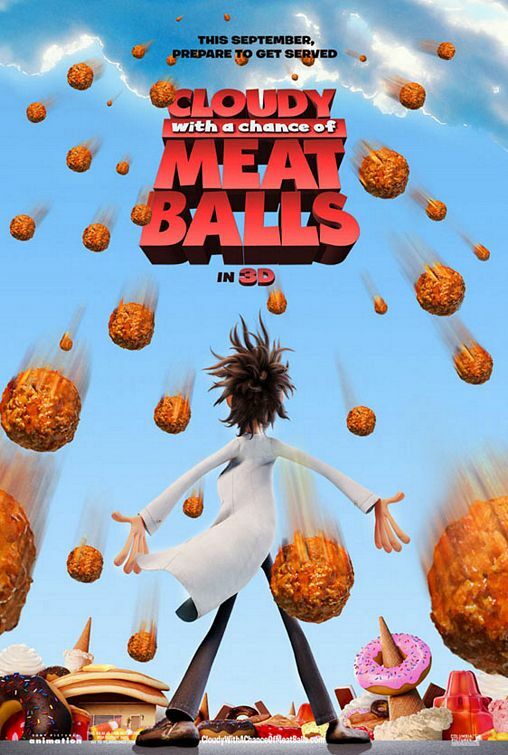 I know I did when I first heard the silly premise of Cloudy With A Chance of Meatballs. And yes, it IS a silly premise. Loosely based on the 1978 book of the same name, the directors, writers, animators, etc. obviously had fun with this premise of food falling from the sky, as there was little bits of slapstick all over the place, sometimes too much, and many times, WAAY overdone. However, a silly premise does not necessarily mean bad movie. In fact, underneath all the comedic bits, overacting, food falling from the sky, and outrageous action scenes lies a pretty decent animated film. Actually Cloudy With A Chance of Meatballs is more than decent, with subtle sophisticated social commentaries, a fun supporting cast, a genuine telling of a strained relationship of a father and son, it’s a really deep and engaging movie. Cloudy tells the story of wannabe inventor Flint Lockwood, and his invention to save the small island port town of Swallow Falls. Of course, the machine turns water into food, and food rains down into the town. At first, everybody is happy, but then, (as always), something goes wrong and Flint and company need to fix it. As stated before, its not so much the story that makes the film, its the depth that the directors, writers, animators, etc. placed in not only the personalities of all the characters, but also the intricate dialogue and situations said characters were placed in that truly makes this film engrossing. True, with such an outrageous plot, there are many elements that just do not work. For one, there really is never a credible villain, like stated before, the mounds of food eventually gets tiresome, and the final act of the film just disintegrates into an action packed food mess. But all those negatives go by the wayside once you hear the hilarious voice acting of Mr. T as the town’s only cop. I was also a fan of the animation. Distinct features were great for the character designs, i.e Tim Lockwood’s bushy unibrow, and the characters had a muppet/ cg vibe that just worked. The animators did a great job not only with the action scenes (some which were overdone), but also in those subtle touching moments of drama and reflection. Just give it a chance, it’s okay to be silly and maybe just like its protagonist, you will see something more than what is initially seen.